Runners, do not freak out! WARNING: This post does not make much sense because I spend a lot of time talking to myself. 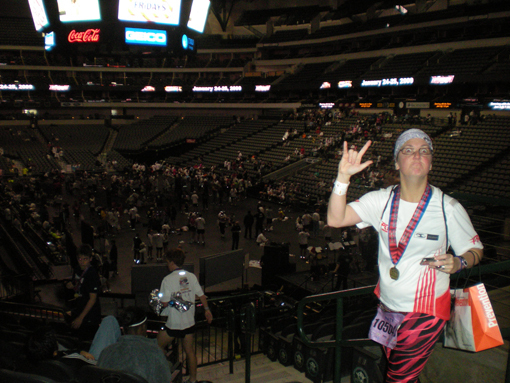 I had so much fun last weekend running the half marathon, I’m itching to do another. Of course, I don’t think I could run too many during Girls Weekend; I’d break down sooner or later. Hopefully later. Anyhow, there is a local half this weekend and I’m trying to decide if I should run it or not. It’s a smaller race but VERY hilly, which would be good training, but the hills would be tough. I’m not a good hill climber on my feet or with my bike, so maybe it would be good for me. But then again, I’m not about hills. You see my dilemma. Half marathons are probably my favorite race distance (at the moment) – and if I ever took it somewhat seriously, I might even get faster. But what is our lesson here? Faster does not mean Funner. * Okay, back to the point, why am I even bringing this up? Because, (and this is where the runners need not freak out – I’ll explain why in a minute) I promised the Chef I would ride the Hotter N Hell Hundred in August. And in order to finish this race I’m going to have to start the training plan he’s put together for me soon – and he has a long ride on the schedule for Sunday – half marathon day. I’m not one with the bike yet, but I REALLY need to start thinking about getting one with the bike – or I might just be dead on the bike. I haven’t made a decision yet, but I think I might run this half marathon and then start the HHH training on Monday. Sound fair? I think so. Okay, so let explain why Runner Susan is still Runner Susan and not Rider Susan. Because as soon as HHH is over, my plan is to start training for another race – maybe even a marathon. I’m thinking Houston in January of 2010. Nothing is set in stone, because I need to do some shorter races too, because I have yet to prove to myself that I actually have fast twitch muscle fibers that can do some damage in a shorter race. Now, I just need to figure out if I’m Type IIa or Type IIb. This is where you can tell I’m rambling because I’ve had 3 cups of espresso. And yeah, I know I should spell check, but I’m too wound up to take the time to do anything productive. Right here is where I was going to talk about how we helped the local vet save the neighbors goat, Vinny. Seriously – it was dark, the owners were out of town, and the goat was on the ground with its eyes rolled back and barely moaning – near death I tell ya. I held the mouth bit while the Chef held the horns so the vet could shove a tube down his throat and relieve him. But then I decided it really didn’t really make sense in the context of all this running and riding stuff so I left it out. 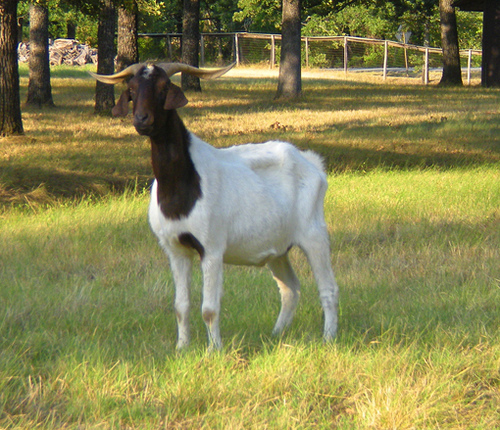 But in case you are wondering, Vinny is alive and well because of our goat-saving kindness. So, Internet People, what do you think? Am I crazy? Delusional beyond caffeine? Does this post make any sense at all? *Yes, I know funner is only a word in Australia, but I think it’s kind of fun to throw in foreign words every now and then – makes me smarter than I look . . . and goes along with all the run-on sentences, superfluous commas and unnecessary explanation points! Would you like a Half Marathon with that Pinot Noir? Why yes. Yes I would. Thank you very much. Would you like some too? 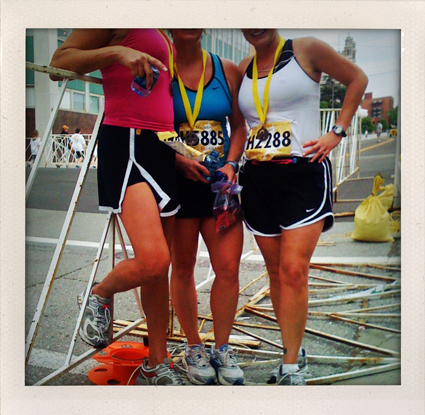 This weekend I went to Oklahoma City to visit my friend, Michelle, and the only thing that got in the way of our wine drinking was a half marathon. You know, that half marathon I trained for by exclusively doing yard work. We had so much fun. And so much wine. After I arrived we headed out to watch Michelle’s Mom perform at the Oklahoma City Arts Festival with her tap dancing squad. And I was quite surprised how much fun it was and how good they were. 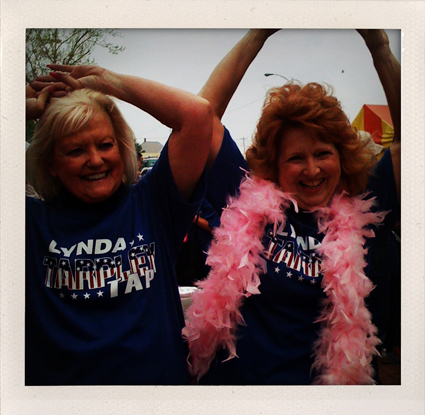 Those seniors are tap dancing fools – It was a blast! Michelle’s Mom is the one in the boa. She is adorable with that boa. We walked around the festival a bit and headed over to a lovely restaurant where we had lunch (a fantastic Gorgonzola burger & fries, shhhhh) and a little bit of wine. After lunch we headed to the Expo to get our packets where the line to get in was 50 feet long. No kidding, almost out the door and the convention center. Yeah. Ummm, not waiting. So, Michelle and I snuck in the back doors only to be sent away because the fire marshal was monitoring the people level in convention center. So guess what? 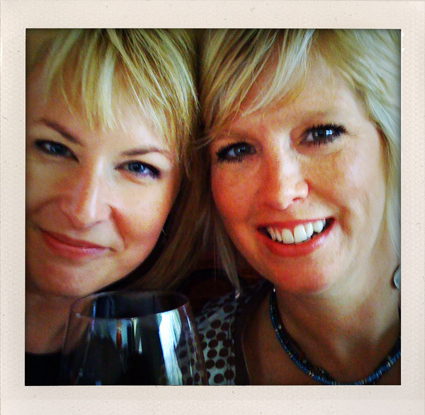 Instead of waiting in line for an hour, we headed back to the restaurant for more wine. 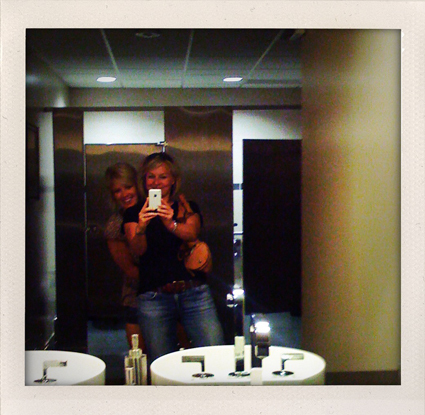 And by the time it was ready to head back over to the Expo, we were taking pictures all over the place, including in the restroom. If you are ever stressed out about heading into a crowded Expo, I highly recommend a few glasses of wine first. We walked right in, grabbed our stuff and were out of there in less than fifteen minutes. Perfect! 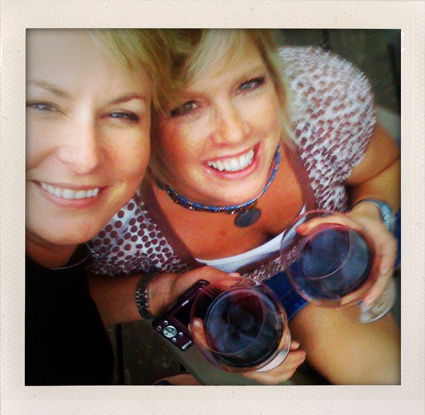 Because we had some more wine drinking to do. 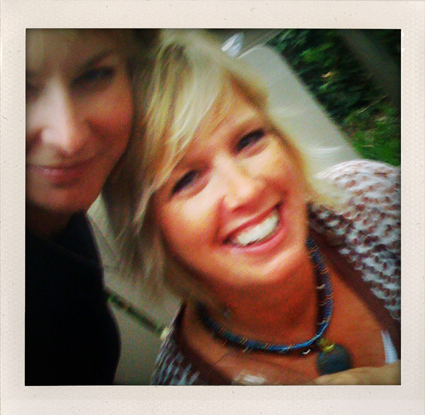 We went back to Michelle’s and hung out on her lovely patio with her husband, Phillip, and drank some wine, ate a fabulous home made race-fuel pizza, and played out with her dog, Daisy. Daisy is the cutest thing ever! And it’s a good thing Daisy and Cherry-Berry can’t make babies because their combined happiness would cause rainbows and fairies to pop out of the sky and the Earth’s entire population would turn into a bunch of panting leprechauns. I’m not making this up; it’s just the way it is. So we’ll just let them be lesbian lovers until it’s time to adopt. 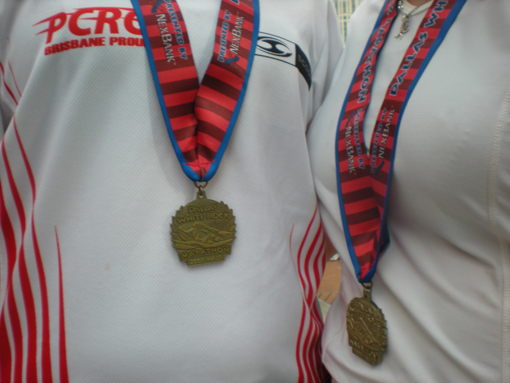 Of course, the next morning at 4AM it looked like we pinned our race bibs on inside out and upside down. Thank goodness Phillip was kind enough to straighten things out. OK Half Marathon from Runner Susan on Vimeo. He was also kind enough to make us his super-secret hydrating potion for the drive over. Needless to say, that was a good thing. In fact, the potion was so good, over 24 hours later and I’m STILL peeing. I’d give you the recipe, but being that it’s super-secret and all, Phillip would have to kill you. We met Michelle’s friend, Gwyn, and were dropped off at the race. 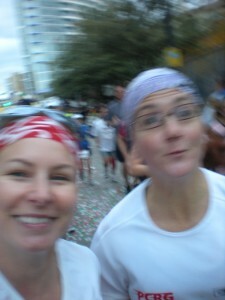 Since the race started about ten minutes after we arrived we hopped into the first corral we spotted. It wasn’t until a few minutes later that we realized we were in the very first “elite” corral. We didn’t say anything and no one pulled us out, because obviously, we looked like all the other really fast Kenyans. We started strong, we ran well and had a great time. Along the way Gwyn taught us about running the tangent. How is it that I’ve been running for a bazillion years and I’ve never heard about running the tangent? I’m not sure how much of a difference it made, but it made sense and kept our minds focused on our next move and not on the person directly in front of us. We finished in 2:18. Which I’m really happy with considering I didn’t really train at all. Except for all that digging and planting. 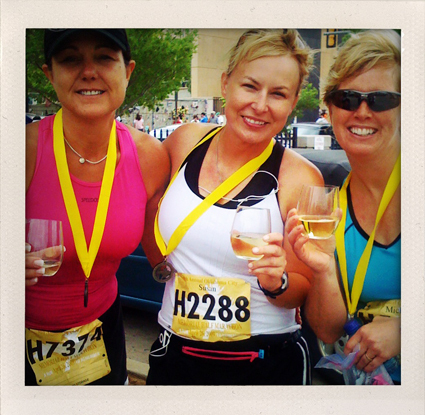 Of course, after the race we were graciously greeted with a fabulous chilled chardonnay. I can’t think of a better way to end a race. Sometimes I think it’s better to be fun than fast because if they were all fast, I don’t think I’d run very many. I can’t wait for the next one, although I’d be okay if it was not 79 degrees with 90% humidity! More pictures in flickr. 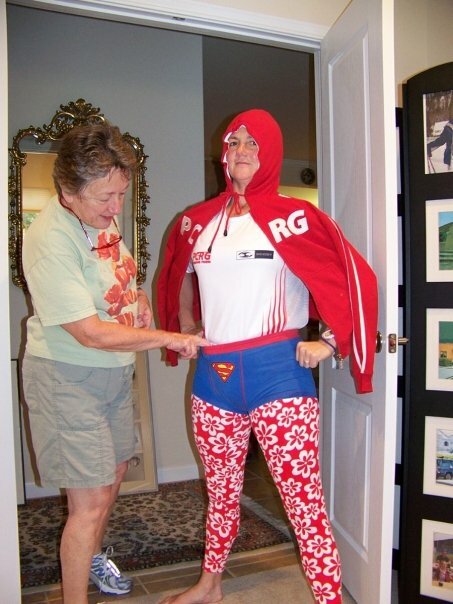 Our original plan was to run the half marathon as Superheroes, but since ILikeToast was a spoilsport and took his manties back to Australia we had to come up with another plan. A plan that was a little more natural for us. And that plan was supermodel racing. And, of course, as supermodels, we didn’t want too run fast or get too sweaty when the photographers have hired 20,000 people as extras for the photo shoot. They even had confetti. 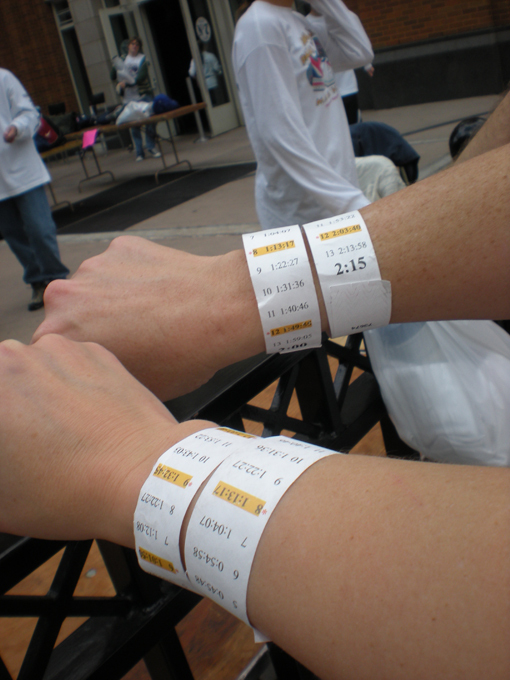 When we were the superhero wonder twins our goal was to finish in 2:00 – 2:15 and we were double banded to prove it. 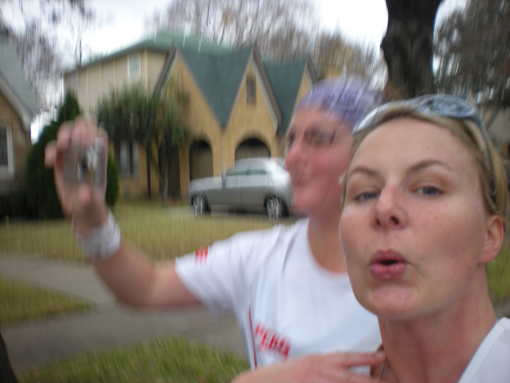 The rest of the race we were chased by paparazzi, and naturally we obliged every photographer with our grace and beauty. We finished in 2:27:55 and received our supermodel medallions and proceeded to the post-race party where Katy would be performing cover songs of AC/DC. I’m sure with each of us not training for 14 days and only getting 3 hours of sleep the night before added a few minutes to our time, but it’s not often you get to run with the great and powerful IHATETOAST . . . and at this race, the longer the better. You can view more pictures by clicking here. 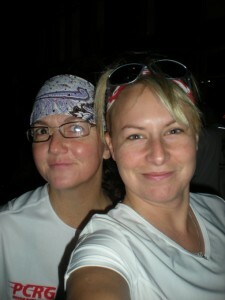 Stay tuned because the Wonder Twins will be participating in the Jogger Egg Nogger 15k on the 20th . . . and boy, those will be some good photos because we will actually be drinking egg nog along the way! I ran the slowest five miles ever this morning. At one point I was going so slow a walker passed me. Massoman even finished and circled back in his car to make sure I was okay. I was. I even saw a shooting star through the fog; I love early morning runs. I’m good with the slow pace today because my plan is working. And just what is my plan? I trash my legs Monday through Thursday for two hours in the forms of leg torture, weight lifting, running or cycling, I recover Friday or Saturday with a Cherry Berry trail run or an easy ride, and Sundays I race or do a long run. I’m not sure if this is a good plan, but it seems to be working so far, although ‘so far’ has only been 2 weeks. Now about that 1:59:59 half marathon . . . the race people have me down for an official time of 2:05 and now I don’t know what to do. I’m pretty good with my watch and I am always within 2 or 3 seconds either way of the chip time, so I’m a little confused how I could be five whole minutes off. Michael says I should use my watch time because he witnessed as the race people messed around with the clock after the race started. But I’m an “official” type of girl; I need to see things in writing to satisfy that “I really did it” feeling – especially when it comes to a PR and running a sub 2 hour half even if it is by only 1 second. So, now I’m really bummed. One option would be to run another half marathon soon and make sure I run it under 2 hours so I have a new, new PR. 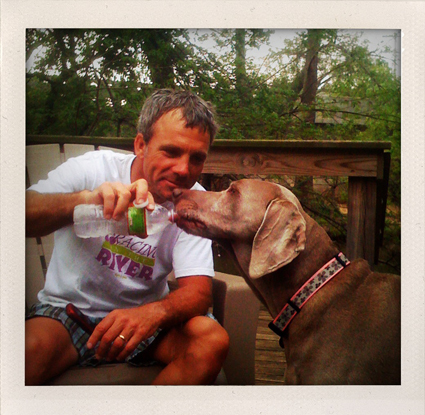 There is one coming up on November 23rd that is along the Trinity River similar to the Fort Worth half. The only problem is I’ve committed to a 20-mile bike rally on November 22nd and I’m not sure if I could PR in the half marathon the day after a bike rally. I am also running the White Rock Half on December 14th, but that is so far away and I’m afraid it might be 100 degrees again – chances are slim that it would be – but it’s Texas, it could happen. Today, I think I ran the smallest half-marathon in history of half-marathons. There were about 30 people registered for the full marathon and about 60 or so registered for the half. I’m not quite sure even if everyone showed up. I was pretty sure I’d come in last – and I’m not sure yet, but I still think I came in close to last. 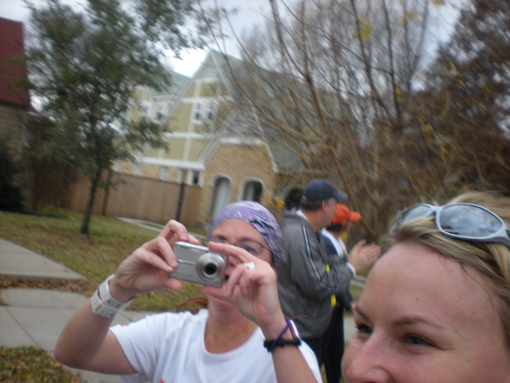 See, here is a picture Michael took at the start and this is pretty much everyone. 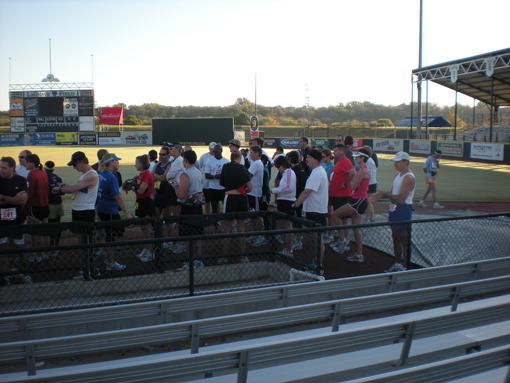 The race started at the La Grave baseball field in Fort Worth and the course was an out and back along the Trinity Trail and ended back at the baseball field. A lot of the course was crushed gravel and, other than getting a few pebbles in my shoes, it was like running on a springboard compared to concrete. And the weather was near perfect at 50 degrees. I was happy. I’m also happy with my unofficial PR time: 1:59:59. I really enjoyed myself this morning. The trail was beautiful and I absolutely loved not being boxed in at the beginning. I forgot how much I love Fort Worth. I will definitely sign up for this race next year. 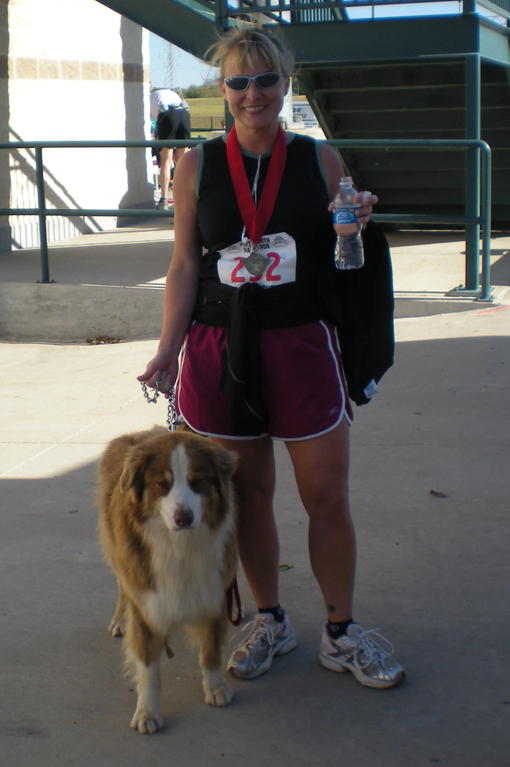 Donkey is not as happy with my time as I am, he wanted me to run longer so he could nap in the stadium a little more. More pictures here. 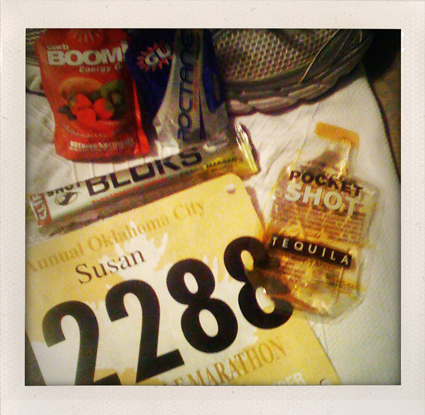 If you want to guarantee yourself an extra hot race day, just invite Runner Susan. Because every freaking race I’ve run this year it’s been one billion degrees outside. Okay, so technically it was around 80 degrees by the finish . . . but it felt like one billion. It was a really packed race and that was a little surprising since I’ve run this race before with half as many people. I guess it’s good that people are getting fit. I meet up with Richie at the start line, we were right behind the 2 hour pace group, and it was my full intention to stay with Richie the whole race, but I was only able to hang with his 9 minute pace for about 4 miles. Then he was history. It didn’t take me long and I settled into a comfortable pace and was able to finish in 2:10:37 (unofficial). UPDATE: Official time: 2:10:34. I’m good with that time; my mind was other places today. 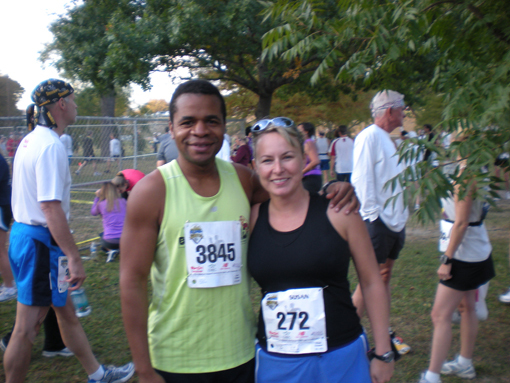 I saw Kevin from 5ks and Cabernets before the race, it was good to see him, he finished in 1:38:59. That’s like super crazy insane fast. Richie took off before I could get a picture – I’m starting to think he’s afraid of my camera. Oh, and I washed my shoes and they performed as good as new. I figured after my drenching in Chicago, the washing machine was nothing.